This entry is filed under Announcements, Events, News. 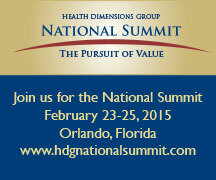 This year Health Dimensions Group is hosting the 5th annual National Summit in Orlando, Florida on February 23-25, 2015. Although there are countless reasons to attend this high-impact 3-day conference, we somehow managed to narrow it down to the top 10. Among this year’s speakers are the top executives and influencers of the health care industry. Access to their insider insights about today’s hot topics is an exclusive opportunity. Not only are you getting to hear from industry experts, you’ll be learning about the topics that are at the forefront of the health care industry. From the panels to the keynotes, you’ll be at the edge of your seat. By attending this conference, you are adding value to your personal brand = and your resume. Health care organizations and employers search for candidates that stay up to date on relevant industry topics. The National Summit provides the perfect opportunity to meet people in the same field outside of your own office. We scheduled ample cocktail hours, breakfast breaks and social time to meet and greet other attendees and speakers. This year’s National Summit agenda has allotted plenty of free time to soak up Orlando’s many attractions. The Walt Disney World discounts that come with your registration make booking your free time that much easier. Reconnect with your inner-child or bring the kids along to enjoy the wonder of Walt Disney. The knowledge you bring back from this conference will not only be interesting, it will be applicable for your organization. Take back new ideas and perspectives to implement in your organization for a successful 2015. By the end of February, things can start to feel pretty bleak. A high-energy conference with passionate speakers and attendees will be the spark you need to reignite your passion for the health-care industry. The Hilton Orlando Lake Buena Vista is an official hotel of Walt Disney World Resort. With golf courses, an outdoor pool, and the beach easily accessible, you’ll consider never going home. The networking you get at this year’s National Summit could lead to more than just a new LinkedIn connection. Your colleagues and peers at the Summit just might be the open door to that new partnership you’ve been searching for – or didn’t even know you needed. Orlando, Florida has sunshine and warm weather year around. Need we say more? If you didn’t sign up for this year’s National Summit, there’s still time to register. We can’t wait to see you in 13 days in sunny Orlando! As More Health Care Systems Merge, How Will You Position Your Health Care Organization to Partner, Bring Value and Stay Relevant? In 2014, the health care industry saw $438 billion in mergers and acquisitions worldwide, the most active year for health care deals in the past two decades. The trend to merge and combine health care systems is expected to continue and is creating new challenges for systems to coordinate care and provide better health at a lower cost. The fifth annual Health Dimensions Group National Summit is focused on the value-based transformation currently underway across the country as a result of the Affordable Care Act. This unique three-day high-impact conference is geared toward forward-thinking leaders of hospitals, health systems, and post-acute and long-term care providers. The conference will be held February 23-25, 2015, at the Hilton Orlando Lake Buena Vista, located in the Walt Disney World® Resort area in Orlando, Florida. Among the many subjects the summit will focus on is the cost pressure the entire health care industry is facing. These are some of the factors that continue to drive change in the scale and scope of care systems. How the collaborative experiences of merging systems are changing the acute, post-acute, and senior care interface; and what lies ahead. How organizations should position themselves to partner, bring value, and stay relevant, as large systems expand and embrace more risk for covered lives. What the alternative payment buzz words really mean for post-acute and senior service provider organizations, and what to expect in alternative payment arrangements. How to approach the payor/provider relationship and develop win-win scenarios for both entities to share in the savings. Industry leading speakers will be present at the event, and the conference will feature Joe Lupica, a veteran healthcare industry advisor. Lupica has served a variety of nonprofit, corporate and public-sector clients and has worked with a number of healthcare companies. He spent time on Wall Street working for Goldman Sachs and other firms. Mr. Lupica also served in the Regan White House as Special Assistant for Intergovernmental Affairs, and was a cabinet officer as Special Assistant to the Secretary of Housing and Urban Development. During his federal service – as now- he has focused on local and regional issues faced by community officials and the people served. “I don’t know how many times I have made use of the information I gleaned from the National Summit. It was such a worthwhile experience,” said Patricia Kapsar, senior vice president of Bethesda Health Group. The National Summit costs $949 for clients and $1,049 for non-clients. This entry is filed under Announcements, Managed Facility Info, News. On May 1, Health Dimensions Group (HDG) took over management of properties in Wadena, Minn., including Fair Oaks Lodge Long-Term Care and Rehabilitation and Tri-County Health Care Home Care and Hospice. Legacy Senior Services acquired both locations and is working with the Wadena Housing and Redevelopment Authority to establish a lease or management agreement to manage the Fair Oaks Apartments, located on the Fair Oaks Lodge campus. This collaboration of services will create viability and sustain senior services for the Wadena community. Residents of Wadena and the surrounding area will be able to work with Fair Oaks Lodge team members to address nearly all senior residential and health care issues, including independent apartment living, home health services, hospice services, short-term rehabilitation, and long-term care services. Health Dimensions Group, a consultation and management company specializing in senior and post-acute care management, will oversee the acquisition and manage the operations for Legacy Senior Services to ensure continued partnership and collaboration with Tri-County Health Care. Representatives from HDG met with employees, family members and residents to explain the proposed transition. Current staffing levels and compensation will continue for employees. While the benefit plan will change with new ownership, HDG will work to create a benefit plan equal in service and cost to the benefit plan currently offered to Fair Oaks Lodge staff. Repeal and Replace, Health Reform, and Post-Acute Care: What’s Next?